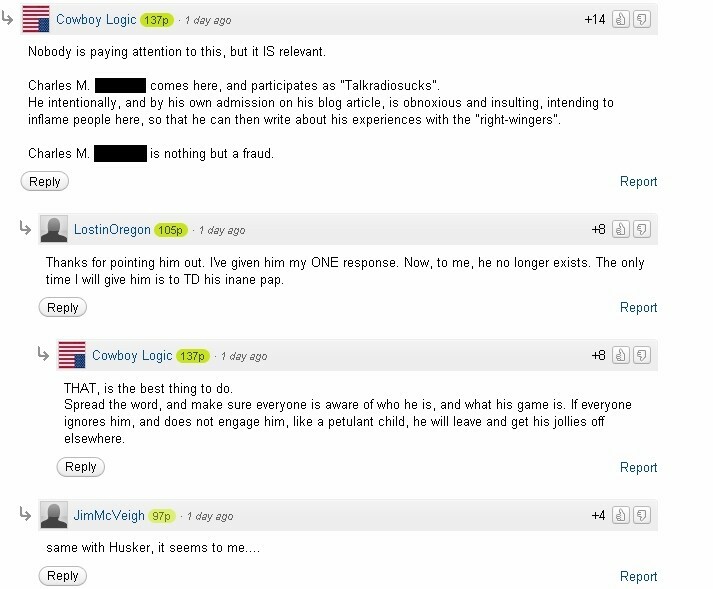 I have reported on the flaming that takes place on right-wing websites like Big Government on numerous occaisions, but it seems commenters on the conservative propaganda websites have decided to take it a step further, and site moderators have no problem with what is going on - commenters are tracking other commenters, who disagree with the site, posting their personal information as well as other sites they have frequented, in an attempt to scare those people from ever commenting on the Big sites again. Thought the shout-out about "Husker" was very funny. 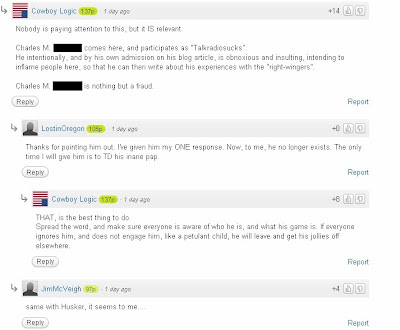 Obviously these people are annoyed that Talkradiosucks comments there, sort of proving Talkradiosuck's article discussing the concept of "groupthink," but what is more interesting is the lengths they would go toattack those with differing views. I have seen comments on websites like "Don't Feed The Trolls," and I am sometimes annoyed by those comments because they encourage groupthink and stagnant conversations that consist of nothing more then some rhetorical pats on the back, but it seems the Big Government types have no problem taking the "Don't Feed The Trolls" meme to the next level. Hey, thank Kevin. I really must get under their skin. Did I tell you I am banned on the bigjournalism and bighollywood sites for going after Jimmy "The Love Boat captain" O'Keefe. They said I was off-topic when I kept blasting Breitbart or his silence when ol' Jimmy went after the CNN reporter. I am patiently waiting for the next post on the health care bill since only 14 Republicants have refused federally subsidized health insurance. This will be a whole lot of fun.